I love this rug! The colors are vivid and fun. The rug is soft yet sturdy and you can incorporated so many colors in your decor with it. I got inspiration from the picture and also purchased a green accent chair and they look stunning together. Well Woven Modern Geometric Tranquil Pink/Grey/Off-white Area Rug - 5'3" x 7'3"
The watercolor-finished Pia rug is the artful star of the Lush Collection. 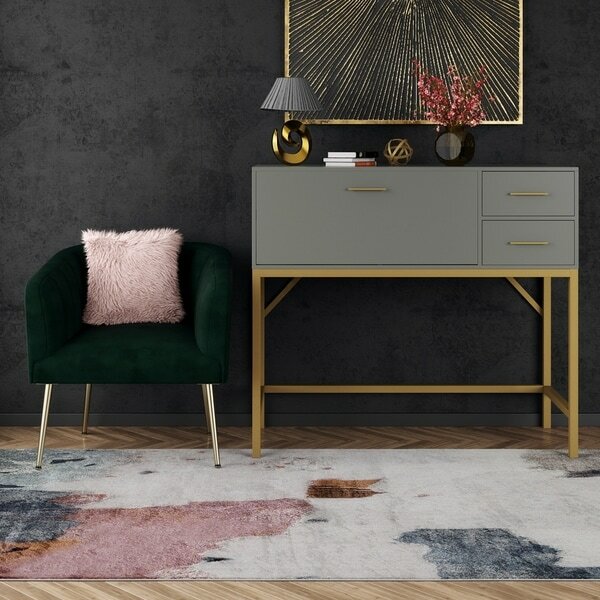 This rug is totally glam and timeless thanks to its cool pastel colors, bohemian motif, and distressed finish. While it has a casual look, this feminine and carefree CosmoLiving stunner is still super-soft with a low pile for cozy nights at home. 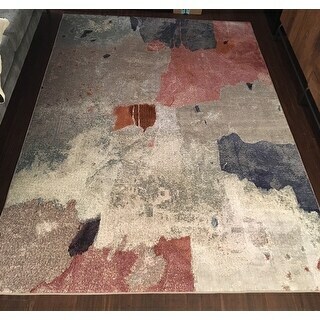 Beautiful colors, I bought the rug because I loved the colors and it did not disappoint. The colors in the pictures are accurate, there’s is a also a very very slight sheen/shine to it which I love. It’s low pile, which I wanted but soft underfoot. The edges are grey trimmed and look well done. It also came rolled and packaged very nicely! So no creases or bends whatsoever. 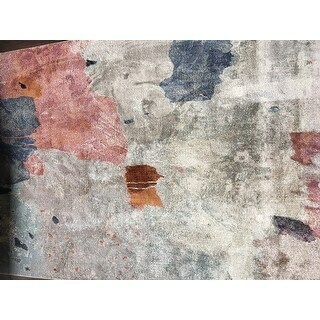 There are multiple tones of grey and it looks like a watercolor painting. I bought it when it was at a higher price so $ bucks for it right now is a steal! I was looking for a rug to update my living room and fell in love with this. This rug was even more beautiful in person, it is very soft on my feet and the colors are vibrant and rich. This is a beautiful rug, just what I was looking! 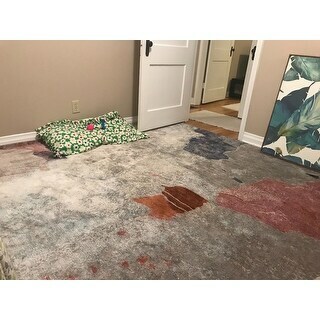 I absolutely fell in love with this rug online. When it was delivered, and I opened it, nothing changed! It is more beautiful in person! I am so very pleased with how this rug looks and feels. Buy it. I was hesitant because there was only one (or two) review when I purchased it, but I looked at over 1,000 rugs online and at. This one was exactly what I was looking for but buying online you never know. In person, it does not disappoint. I regularly look over at my living room and say, "I LOVE that rug." It brought everything together and has so much character. I look at it from different angles and love it more. Now, if only I could find a coffee table. "Is that desk/table in the background on Overstock?! It's gorgeous!"